Learning how to take short-cuts, enables us to offer hospitality more often. We can open our heart and homes to people because we don't end up feeling totally exhausted at the end of the visit. During my Top Ten Hospitality Tips training, I shared about making a simple Valentine's Day tray as a way to demonstrate how we can easily bless people around us as we use short-cuts! You can treat someone you love and care for to a pretty Valentine's Day tray. Surprise a teacher, neighbor, teenager, friend or spouse. It can be quick and easy to do. I brought cupcakes and strawberry milk and a small pack of chocolates wrapped in pink paper at my local convenience store. Pink icing is easy to make (add the food coloring with a toothpick or you will end up with red icing!) You can add it on top of the white icing for some of the cupcakes to provide variety. Add some sprinkles, cut out a small heart from paper (I used the cardboard from the chocolates! ), add a tiny flower and you have designer cupcakes for almost nothing! I put the cupcakes into some cuter cupcake holders that I had and tied a ribbon around one of them to add an extra touch of whimsy. Set a tray with a flower in a little jar, a pretty napkin, one of your cupcakes, some strawberry milk (bought or homemade) and you are all set to bless someone! Look around your home to see if you have any other items that will add to the theme and include those. Add a heartfelt note and share the tray. What a blessing! Please share your trays with me so that I can post the photos. Let's encourage each other. And please share this blog with friends. Encourage them to become part of our Heartistry community! Many people are so busy nowadays and are struggling to keep up with their crazy schedule that family meal times are rushed and infrequent, if they happen at all. Gathering at the table is one of the most powerful things you can ever do with your family. Your own experience may have been good, or troubled, but you now have the opportunity to start this impactful practice with your own family. Here are 18 reasons why! Mother's Day can be a joyful day for some women and for others a time when personal loss is felt more acutely. I encourage you to take time on Mother's Day to honor and celebrate some of the special women in your life. Call your mom, grandmother, daughter, sister, cousin, friend and let them know that you appreciate them. Write an affirmation for your mom or a woman who has touched your life. For tips, read my blog on How to Write an Affirmation. Your words will have a deep impact. Buy a bunch of flowers from the grocery store and arrange them yourself. Give them to your mom, a neighbor or an elderly woman living on her own who needs encouragement. Check out our Heartistry Pinterest page for simple ideas. Deliver an early morning tray to someone's bed (if you live with them) or put it on a friend's doorstep. Check out instructions and photos here and on our Heartistry Pinterest Page. Bake some scones and invite some women over for afternoon tea. Check out my 5-Minute Scones Video. Set a pretty table. Here are some ideas to get you going. Host a simple Brunch. Read my Spontaneous Brunch blog to see how to pull together a last minute brunch. If you are a woman, be kind to yourself today and give yourself grace. You are precious. You are loved. When you hear the word hospitality, what do you think of? The hotel industry? A fancy meal requiring a lot of work? Women folding napkins? Hospitality is so much more than this. We need a new word to capture the power and potency of this impactful practice. Or we need to have an understanding that hospitality goes way beyond just a meal. True hospitality is Generous Living. The world needs people who will step out in radical generosity. This is not easy and challenges us to the core of who we are. What prevents us from reaching out? Are our lives too busy for authentic, relational involvement and loving care? Does the sorrow of the broken world in which we live loom so large that it paralyses us, preventing us from even doing something small? Are we trying to protect our families and ourselves and thus have no time, energy or compassion for those outside the walls? Here are 10 ways in which we can tame or at least tie up the self-centered parts of ourselves as we seek to grow in generosity! Please sign up to receive notifications of future blogposts. We will be providing encouraging and inspiring information to help us grow in generosity and hospitality. I think there are two reasons why people don't open up their homes in hospitality (well, maybe more than two, but let's start with these). They lack the vision of the impact it will have and they don't feel they have the skills to pull it off. Let's focus on equipping you with all you need to host a small group of people at your home. First you have a choice to make: Do you want it to be Simple, Special or Spectacular (or heading in that direction)? This will depend on your experience, the time you have allotted to prepping for the meal and what the occasion is. I plan to give you outlines of Simple, Special and Spectacular Dinner plans on the Heartistry blog. We will start with a Lemon themed dinner. Mostly everyone can find lemons in their grocery stores, they are not expensive and work well as an ingredient in the meal and to add in for the decor. Our basic meal will remain the same. We will use Lemon Chicken from Southern Living. For the recipe, head over to : http://goo.gl/m9J4HH. (By the way, there are countless recipes online. I just picked one that looked very straight forward.) It is super simple and won't take long to prepare. It only has 8 ingredients including the salt, pepper and lemons. Serve with rice and a simple green salad. Serve a small bowl of store bought lemon sorbet for dessert (or ice-cream if you can't find sorbet). Got that? Buy a few extra lemons and place them in a glass bowl on the table. If you have yellow napkins/serviettes you can add them. If you want to get more fancy, take a moment and add the napkins/serviettes to the glass. Easy right? And more fun and festive! Serve your simple meal, relax and enjoy your guests and you have made a start! Well done! Are you ready to step it up a little? Use the same recipe but this time buy a bunch of white flowers. Take your lemons and push a chopstick, skewer on even a pencil (not the lead end) into the lemons. Add the lemons into the flower arrangement! Now you look like a real pro! After the Lemon Chicken meal, you may wish to serve some lemon bars, lemon meringue pie (my husband's favorite dessert is South African lemon meringue- see photo) or a little lemon flavored cookie with your lemon sorbet. You can bake them if you feel inspired or buy them ready made. 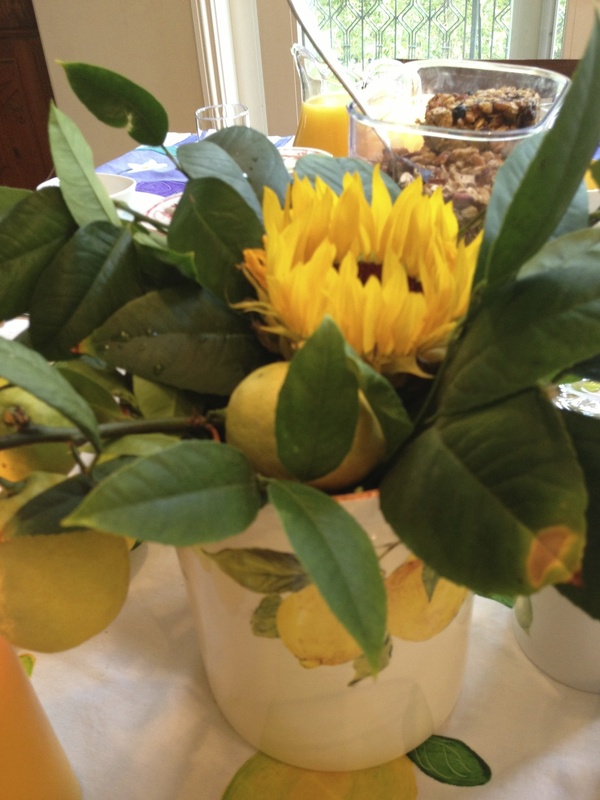 When your delighted guests leave, remove the lemons from the flower arrangement and use them in a long, cool drink. You have prepared a very special meal. Excellent! South African Lemon Meringue Pie with a tennis biscuit crust-yummy! Are you feeling ready for a bit more of a challenge? Let me share a secret. You will be amazed at how easy it is to make something look spectacular with not much extra effort, so here goes. Use the same Lemon Chicken recipe. When you serve it, place the rice on the plate first, add the chicken breasts and then garnish with slices of lemon. If you can get hold of some lemon leaves, add them as well. 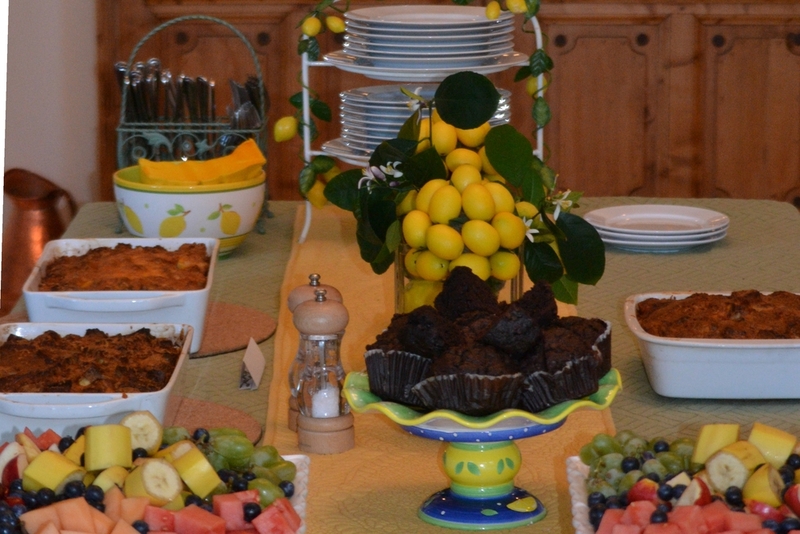 This photo is not of the Lemon Chicken meal, but gives you an idea of how to set out a lemon themed buffet dinner and how to garnish the plate. 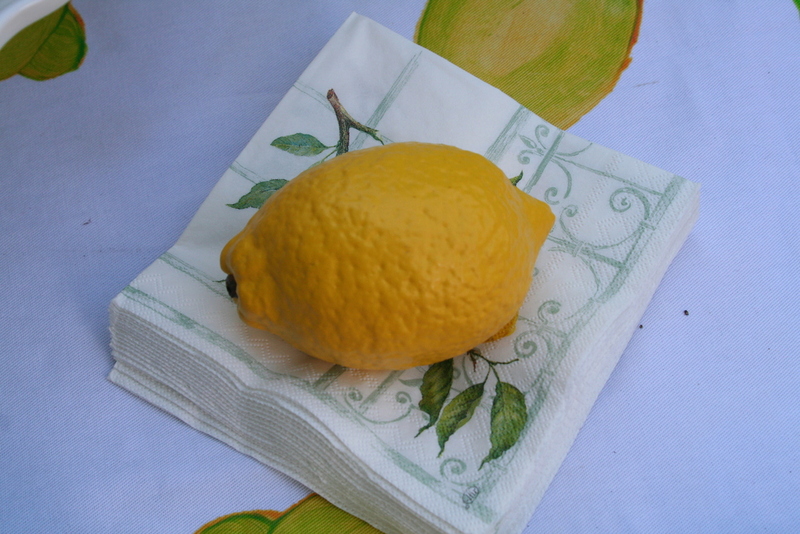 When setting the table, add yellow or lemon-themed napkins/serviettes. 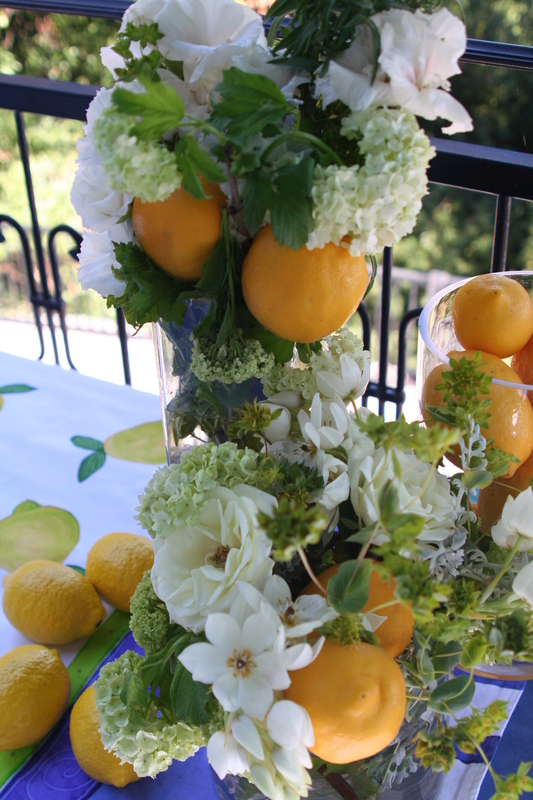 You can arrange the white flowers with the lemons in them, but make the arrangement larger and grander! Use lemons as part of the decor. If you are feeling very creative, purchase a piece of white cotton fabric and sponge paint lemons onto it with fabric paint (I told you this was going to be spectacular). If you want lots more fun ideas, head over to the Heartistry Pinterest Lemon Decor Board. Just a warning; this can be overwhelming, so promise me you will only try one or at the most two ideas. https://www.pinterest.com/HeartistryInfo/lemon-decor/. The choice is up to you. Will it be Simple, Special or Spectacular? The main "s" to take into account is Start! Unless you START to reach out and try, you won't have the joy of seeing what joy an evening together with family, friends and even strangers can be! Please share your Simple, Special and Spectacular photos with me so that I can share them on our Heartistry Facebook page. And I would LOVE to hear what you think about this idea, so please add your comments! Please share this blog with your friends too! Sign up and be kept in the loop! P.P.S. In case you want to cook for a crowd! Preheat oven to 425°F. Remove chicken from marinade and place in a single layer in a large baking dish, skin side up. Line baking dishes with foil! Reserve the marinade. Use a pastry brush to brush a little melted butter on to each piece of chicken – don’t skip this step! Makes the chicken look brown and beautiful. Bake for a total of 50 to 55 minutes, until the skins are crispy brown, and the chicken is cooked through, juices running clear (thighs have an internal temperature of 175°F). At about the 25 minute mark, baste the chicken pieces generously with reserved marinade. Let rest, covered in foil, for 10 minutes before serving. I am delighted to welcome my dear friend Shirlene Wood who lives in Panama and participated in the Just Add One challenge. Shirlene shares a little about her life in Panama and what hospitality means to her living off the grid where she travels to get her groceries by boat!! "Three years ago our little family arrived in Bocas to live, in response to a very clear leading from God. What a change from our wonderful, full life in the beautiful Pacific NW! We'd never lived off grid, relied on rain water collection, or even driven a boat before. I'm so grateful for the people who graciously came alongside us and helped us adapt to our new, foreign surroundings! Life is simpler and more complex now, challenging and full of unexpected joys and victories. A few years ago we would not have imagined where God would lead us, and what life would look like today, but I can honestly say that I wouldn't go back to the wonderful, full old life we had. Sometimes less is indeed more!!! (This doesn't alter the fact that I still miss my family and friends and easy access to Bubble tea and good Thai food, or driving a car and Fall weather). Life is good and rich and I am thankful. I am very excited about the Heartistry site and I wanted to participate in one of the Heartistry challenges. I wish I had more photos though, because the opportunity to "just add one" (or many more) appears quite often here in Panama! I think it has a lot to do with the fact that when you live a bit more isolated and more remote, people are more eager to visit and stay a while. Saying goodbye to one of the visiting teams who leave by boat for their next destination. There isn't the same "rushed" frenzy here and errands and tasks consuming the day. There are also no fast food joints, little bakeries or a plethora of restaurants to choose from to grab a bite to eat on your way home. If someone's visit lingers into meal time, they are more likely to accept an offer to stay for lunch or dinner, instead of rushing off. I imagine this must have been a bit more what it was like in the "old days" when going to visit someone was intentional and your closest neighbor wasn't a 2 minute car ride away. The people here don't have the same commitments to work, church, sport practices and games, or school events. People are a lot more available and have a lot less going on. Shirlene's daughter Ellie helps to hand out the glasses to local people during a clinic. Back home in the States I would say we had a lot of interactions with people throughout the day as well, but it was more rare to have an individual accept an offer to stay for a meal, or even to be able to plan a day to have a meal together. Once you compare your schedules of when both parties are available, it usually is quickly limited to a date that's a week or two away. Here, it's very easy to call someone up at the last minute even to say, "hey, if you don't have plans, you should join us for dinner tonight!" When it comes to our indigenous friends and neighbors here, the invitation to come over to eat, or an offered plate of food, has never once been turned down. To some degree, I think this has to do with the culture and the perception that you should accept what is given to you. And perhaps a poverty mentality comes into play too which triggers a "take whatever you can get" mindset. But they are accustomed to feeling hungry, and often skip a meal (or two), so when a plate of food or a snack is offered, it is always received. Something I have tried to be mindful of and teach our children is that as privileged North Americans, we don't have an understanding of what it is like to not eat for three days. We say we're "starving" when we've missed one meal! We can't always help them with what they need, and won't always give them what they are asking for, but I do feel compelled to offer a chair and something to eat or drink as often as we can. Shirlene's daughter Bella enjoys Easter candy that was sent by friends. This week on two different occasions, our Bella came running into the kitchen to ask me if she could offer a snack to some of the locals who had come by. I know that kids learn by the example we set, and I know that I was blessed to grow up in a home that often extended hospitality to others, but I'd love any kid-related tips you might have for developing that skill and gift in them! Shirlene offers hospitality to many people; visiting teams, local villagers, family and friends. This week we invited a friend whose wife was out of town, to join us for dinner. He came again later in the week and ended up staying for lunch. :) We also were blessed to be hosting a few people from the States who came to do ministry here. Later in the week someone came to help with a project and when his water taxi was late to pick him up, we told him to stay and eat with us. He profusely thanked us for the Red Thai Curry Chicken and rice dinner we were having that night because he said he loved Thai food and the only Thai restaurant in the area closed a couple of years ago. He said, "Wow, you took me back to three years ago when I would eat Thai food every single day. This was so delicious. Thank you for bringing back a good memory for me." I think we underestimate the power of hospitality, of welcoming people to share in life with us, whether over dinner or a cup of coffee or tea. Like the power of testimony, we bring to the table what we have (and it sure doesn't have to be fancy) to share with others, and to draw them into our space. There's an intimacy of breaking bread together, or sharing thoughts and moments with someone over a cup of tea. And it sets the stage for developing and deepening relationships, and is the platform for opening up and sharing. That's what I love about inviting people in. I still don't really love to cook, but I do love to feed people and share our space with them! I love that people respond so positively when they are served in this way. I like to send home some leftovers with our guests (assuming they liked the food!) or extra servings of dessert with whoever has joined us and I think it's a nice way to extend that hospitality even after they've left. Having been on receiving end of wonderful hospitality too I know that for me I feel valued and loved (and often quite humbled) when someone generously welcomes us into their home. Hospitality offers an opportunity for a blessing to be enjoyed by both the giver and the receiver! Thank you, Lyn, for being such a model hostess...who in addition to serving wonderful meals or special tea and cookies, also is able to give special attention and engage with those gathered on a heart level. This is the perfect combination of Mary AND Martha! Much love to you! I hope the fact that it's been so long since I've gotten to have a cup of tea with you means that the next face to face chat is a lot closer! :)"
Thanks Shirlene for opening your heart. You truly have the heart of hospitality! We honor you here at Heartistry!! I have traveled extensively (to over 39 countries) and have learned how to pack and how to travel! I have had to plan well so that I can be suitably dressed for business occasions as well as have clothes for leisure. My most complicated packing assignment has been when I have visited a few countries and 2 hemispheres in one trip requiring clothing suitable for different locations and climates. These challenges and the need to take just one modest sized case with me, has led to my PhD in Packing! There are many methods, but I will share what works for me.